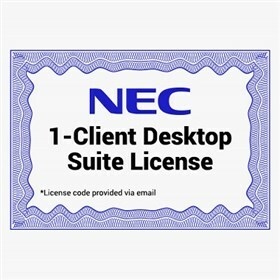 The NEC 1100087 is a 1-client desktop suite license administered by NEC. This enhances the capabilities of your digital business telephone system which will provide exciting features such as placing a phone call by clicking directly on your contacts from MS Outlook. Provides one user with "Desktop" and "Softphone" features. Desktop allows user to control their telephone from their PC, review/manage log of incoming/outgoing calls, initiate calls from MS Outlook Contacts folder, and view screen-pops. The NEC 1100087 has many exciting features for users of all types. The NEC 1100087 is sold as a Brand New Unopened Item.